Should Dolphins coach expect a fine for stepping on field of play? 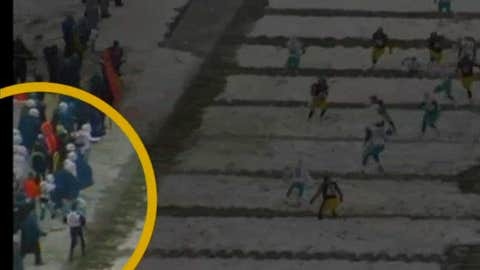 Steelers head coach Mike Tomlin’s $100,000 fine for interfering with a play was supposed to send a message to all sideline personnel in the league. Don’t stand on the field. Well, a Dolphins special teams coordinator apparently didn’t get the memo, according to video obtained by FOX NFL insider Jay Glazer. The coordinator stepped onto the field during a field goal return by safety Troy Polamalu. The Dolphins weren’t flagged, but did he have direct interference with the runner? We’ll wait and see whether the league decides to launch an investigation into this matter and whether officials possibly levy a fine against the coach.